Italian Grain Cowhide leather. Babila Brand. Drop down front for easy access. Padded removeable laptop envelope. Adjustable velcro divider & removable central divider. Two end Pockets. Retractable trolley.Near the wheels plastic cover for protection while moving this trolley. 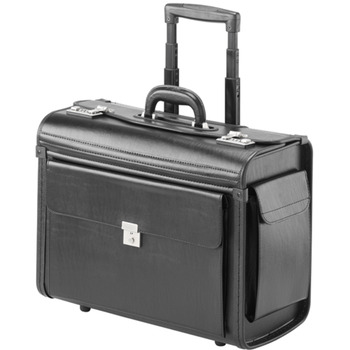 Front Pocket is gusseted type & inside lot of Organisers , Front Ket type Lockable compartment. Two side Pockets with Velcro flap fasteners.